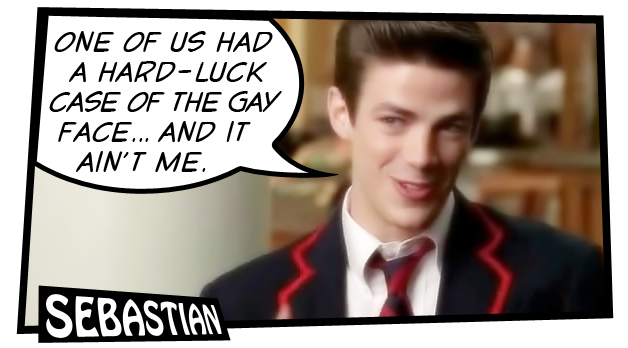 In a recent episode of Glee, fabulous Kurt trades insults with rival Sebastian (over a boy naturally). “I don’t like you,” says Kurt. Google the images for “gay face” (not at work unless you’d like to change jobs) and images flash up of Taylor Lautner, Zac Efron, Daniel Radcliffe and Piers Morgan among others. Look at Urban Dictionary and its current top definition of “gay face” claims that gay men adopt facial expressions that are similar to women, so they get a tightness round their mouths from pursing their lips, and an eye expression that is “surprised looking and predatory”. Along with that, there are signs of conscious manipulation – manicured eyebrows (we love to pluck) and a tan or “leathery” look to the skin (because gay men can’t stay off those sunbeds). Is there any truth in this sorry little collection of negative stereotypes? I would warrant that yes, some gay men do exhibit some of these features at various points in time, but many, many gay men do not. Here are some gay men who don’t have the gay face (according to me, you may disagree): Rock Hudson (film star), Derren Brown (illusionist), Ben Bradshaw (MP), Waheed Alli (Labour peer), Gareth Thomas (rugby player), Neil Tennant (singer), Alan Turing (mathematician), Michel Foucault (philosopher), Anton Hysen (footballer), Ricky Martin (singer), Russell Tovey (actor). Some heterosexual men will also display some of these features, and many women will not. Yet research published in the Journal of Experimental Social Psychology in 2008 found that 90 participants, shown 90 faces (half gay, half straight) scored above chance on identifying sexuality. Even when the faces were shown just briefly, for 50 milliseconds, people could do this. And even when faces were imposed on a white background, their hairstyles were removed and their photos were taken from other people’s Facebook pages (so they weren’t self-portrait pictures), people were still pretty good at spotting who was gay. Why would this be the case? I think it’s to do with how you view your own sexual identity and whether you view yourself as belonging to the mainstream gay culture – “the scene” to use a quaintly 1980s expression. At one extreme there are gay men who come out of the closet, move to an urban centre with a large gay scene, go to gay clubs and bars and have mainly gay friends. Then there are gay men who are “out” but don’t have many gay friends and don’t go on the scene. And finally, there are gay men who never come out of the closet, and are very good at concealing their sexuality. The types of gay men who are selected for these sorts of “face-spotting” studies will be the openly gay ones, and as a result, some of them they may have picked up some facial expressions associated with highly visible gay men who exhibit some of the stereotyped features. The media loves these stereotypes, so they tend to have a higher visibility than other types of gay men. We tend to copy who we hang around with or who we see. This would explain why people can spot gay people at a rate better than chance. But that doesn’t mean they’ll be 100% accurate (the JESP studies were right about 70% of the time). I think my gaydar is pretty well-tuned, but I can attest to various embarrassing incidents where it was 100% wrong (misjudging straight people as gay and vice versa). So gay face really means “camp face” and that’s why it’s been used to criticise allegedly closeted gay men (especially conversatives) like Marcus Bachmann, the “ex-gay” therapist husband of US Republican presidential candidate Michele, or Illinois representative Aaron Schock, who not only apparently sports the gay-face but has a gay shirt, belt and trousers. Like the also 1980s-sounding term “straight-acting”, gay-face is a monumentally oppressive own-goal. First, it’s almost always used as an insult, and implies that there is something bad about being gay (let’s clear this up once and for all – there isn’t). Second, it makes the classic error of conflating sexuality (who we fancy) with gender (whether we act butch, femme, both or neither). And third, it’s one of those double-edged swords that tells us quite a bit more about the person who uses it, than the person who it is used on. If you’re calling someone “gay face” then I’m going to go out on a limb and guess that, not only are you a little bit catty, but you’ve also bought in to all the nasty homophobic and genderphobic stereotypes that mainstream society has been using to make gay men second class citizens for decades. Marcus Bachmann deserves to be criticised and shamed for running “ex-gay” clinics. He should be challenged repeatedly. But calling him, or anyone else “gay-face” doesn’t demean him. It just demeans us. I’m a gay man. Ergo, I have a gay face. And I’m proud of it.